Though our bodies and some mental faculties are undoubtedly the products of evolution, there is one powerful function of the mind that could not have arisen by evolutionary processes. It is the ability to understand, predict and control physical, chemical, biological and technical systems through the use of mathematics. This ability could not have arisen through natural selection because it would have had no selective advantage until very recent times. In the Middle Ages it could even have got you burned at the stake. According to the materialist's worldview, the mind (including mathematicians' minds) is an epiphenomenon of matter which has evolved solely to ensure the survival of the selfish genes which code for it. Why should this 'top-level' epiphenomenon have such intimate access to the 'bottom level' physical phenomena such as quantum physics? After all, the two levels are separated by less well-understood (in some cases) explanatory layers such as evolutionary psychology, neurology, cell biology, genetics and molecular biology. Mathematics does not exist 'out there' ready to be discovered and understood. Nor do numbers fundamentally relate to any material things. Numbers arise from the mind contemplating the empty set in the total absence of any 'things' to to be counted. And yet this very abstract mental contemplation, which is at the root of mathematics, appears to be fundamentally interwined with the way all physical things exist and function. The fundamental particles of the physical universe do not exist as 'things'. They are mathematical entities - probability distributions which do not collapse into actuality until observed by mind. 4. The mind is not a machine. All physical systems, including machines, can be simulated by computer hardware and software in terms of algorithms and datastructures. Some attributes of the mind appear to be non-algorithmic, and consequently non-physical and non-mechanistic. This explains why after decades of hype, artificial intelligence is still no nearer to reality. In fact, the very structure of the Turing Machine seems to preclude intelligence due to its inability to deal with intentionality. There is no one-way chain of causation between events in the brain and qualitative mental states. Rather the mind appears to impute or project reality over the contents of neurological datastructures within the brain, much as a PC operator would impute text, graphics, windows etc over the two-dimensional array of dots that comprise a computer display. 6. The mind cannot be an emergent phenomenon, emergent property or epiphenomenon of the brain, because emergence presupposes a mind from which to emerge. Emergence is a purely psychological activity. Emergent properties emerge from the observer, not from that which is being observed. All scientific models are emergent properties of the mind, such as the different causal and organisational relationships which appear at different levels of investigation. For example, the mechanisms of natural selection and evolution emerge out of ecology. Ecology emerges out of biology, which emerges out of chemistry, which emerges out of physics, which emerges out of mathematics, which emerges out of emptiness. Each level of investigation has its own explanatory relationships, yet if we check carefully there is no 'added extra' coming from the side of the objects. (Everything is algorithmically compressible without remainder, there are no mysterious ingredients added as we progress from lower levels to higher levels). The mind creates all these models, yet there is no way to model the modeller. (see Mother of All Algorithms). Our minds, although influenced by biology and society, are not fundamentally biological or social constructs. We can use analysis and meditation to liberate ourselves from the tyranny of the selfish replicators. 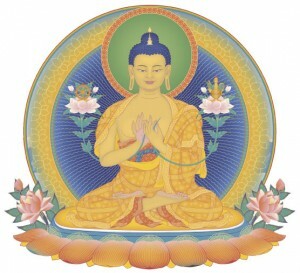 8 The formless, non-material nature of the mind can be experienced in meditation. The fact that the mind is formless means that it is unconstrained, and hence has immense potential. The mind can comprehend all objects including its own creations. The description of the root mind as 'formless' does not refer just to its non-material nature, but it emphasises that it is unlimited, non-mechanistic and totally free from any structure or topology. So it it is free from steps, loops, branches, strings, tables, stacks, queues, datastructures and all the other algorithmic constraints . In Buddhist psychology the root mind is non-physical and non-algorithmic. The mind cannot be understood in terms of circuit diagrams and flowcharts. It is pure awareness.